Your site content isn't vanilla, so why is your portal's login? Add pizazz and functionality to your site login with custom templates, localization, redirection rules, SQL Validation, and Single SignOn. Want more? How about Facebook, Twitter, and LinkedIn integration, too? Your login has never been more exciting! Experience Facebook Connect for yourself! Go to our Login Page and simply click on the Facebook button. Dive into Social Media integration with Dynamic Login! Social Media is the HOTTEST trend right now and only getting hotter. Dynamic Login by Data Springs is the absolute easiest way to turn those thousands of connections into exponential growth! Your site content isn't vanilla, so why is your portals login? Responsive design and LDAP support is the focus within the 5.0 release of Dynamic Login. Responsive Design – Now allow controls within the administration interface and user-facing interface support a responsive design capability. No more tables and table rows! LDAP support – Now support LDAP authentication. Integration with Active Directory has never been easier. Updated support for DNN 7 (including verification code changes, password retrieval procedures, and included support for social media necessary patches within Facebook, Twitter, and LinkedIn. Social Media integration is the focus in the first module update in the Collection 5.0! New Twitter Connect Integration – Now allow users to login via their Twitter account. Optionally post a message to their Twitter account profile whenever they sign in via the Twitter Connect integration feature! New LinkedIn Connection Integration – Now allow users to login via their LinkedIn Account. Optionally post a message to their LinkedIn account profile whenever they sign in via the LinkedIn integration feature! Update Facebook Connect – New features that fix new requirements for OAUTH 2.0 w/ Facebook! Updated Facebook Connect – New features to store the Facebook Authentication Token within a session variable (and the option to then use it/store it within a user profile field)! MAJOR NEW FEATURE: Facebook Connect! The Facebook integration goes beyond the basic connectivity and offers numerous other options for maximum benefits! Optionally map existing users at sign in based on username or email address for authentication. Create new users and use the Facebook UserID or email address as the username. Define your own username prefix when user auto-creation is selected. Integration with Dynamic Registration allows you to silently register a user after logging through Facebook and fire off completion events to send emails, add roles or run SQL statements as if the user filled out the form! Optionally store Facebook UserID and User Creation Status as a DNN profile property. Important details when you want to filter and generate reports to see how many users were created via the Facebook Connect. Full redirection controls after account creation. Define authentication page type for Facebook sign in – either redirect to same page or use a pop up window. Select an alternate image for your Facebook Connect button. Use your own images or use our handful of options. Integrate with other modules or 3rd party applications to expand your admin processes, and enhance your user experience! Manage HTTP posts with a variety of settings and conditions. Set the URL and details to post. Take advantage of features from other modules. For example, you can easily integrate this with our OptIn Email module or post to Dynamic Forms to trigger completion events like Emails, SQL, and role assignments. Easily integrate with other Facebook modules by including a request for extended permissions. Let users grant permissions to post on their wall and to access friend lists, check ins, user about me, user activities, user likes, user interests, etc. Leverage the power of social networking to build your business! See Permissions List here. Increase brand recognition by posting on the user’s wall that they logged into your site via Facebook Connect. Your post can be a title, a link, an image, and/or a full message. Control the frequency of posts on your user’s wall. The “Wall Post Days Delay” allows Dynamic Login to only post to their wall based on your pre-defined number of days. For example, if you specify a 90 day delay, and the user signed in every day for 100 days, the system will post on the user’s wall on 2x – once for the initial login and the next on day 91. Experience it for yourself! Go to www.datasprings.com and log in using the Facebook Connect Button. Now supports automatic login – Allow automatic user login simply by passing the appropriate form or querystring variable. Great for integration with other systems. Get all the power and functionality of Dynamic Login with the fun jQuery pop up features of DropDown Login. Fully tested against DotNetNuke 5.5. New Control Panel – New quick control panel from the user-facing page. This new control panel includes quick access to all of the major control panel and configuration options. There is also an option to hide this from the user-facing page if you prefer not to use it. Enable SQL Validation – If you need extended validation besides just checking the username and password then this feature is for you! Use it to check the userID against other tables/queries to validate login. Use this in combination with Single Sign On's ability to check for valid user credentials for the portal, or check for a valid IP address. SQL Execution Upon Login – Utilize this feature to fire off a SQL Event upon a successful login. This feature can be used to insert records into a log table for reports. Synchronization for User Roles from the Parent Portal – This feature will allow you to synchronize user security roles with the master portal. Iportable – Easily import and export content from the Dynamic Login module into other pages or portals. Integrate with Data Springs' Authentication Provider Add On - Purchase the Authentication Provider as an additional component and utilize all the Dynamic Login module features within the authentication provider itself! Performance enhancements for control panel and login process for single sign on. Ability to block specific IP Addresses from logging in at all, including a description of why you blocked the IP Address. When blocking an IP Address, you can block the IP globally for all portals or per portal within the installation. Content Localization - Your Dynamic Login templates can now be customized per language so each language can look different! Enhancements for integration with Dynamic Registration and DNN when forcing a user to change their password and/or forcing a user to update their profile. Complete layout control - Now you can setup a custom template for your login page. This means that if you don't want to include the register link at all, or the 'Remember Me' or 'Send Password Reminder' links, you can simply remove them from the template, change the labels, or the look of the fields. Want to put both the username textbox and password textbox on the same row? 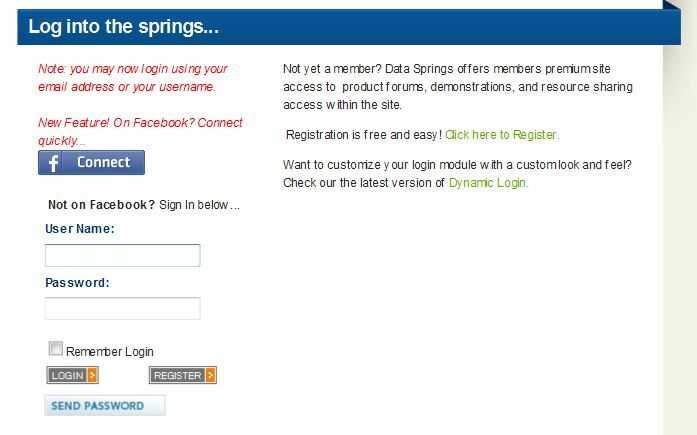 Login to Data Springs to see an example. With new login tokens you can also choose to use Login Image Buttons instead of links buttons for your login page. New feature to allow the user to be able to sign in with their email address. 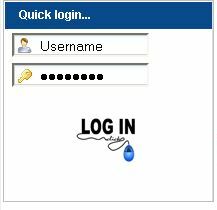 New feature to allow the user to be able to sign in with their UserID (the number, seperate from the username). New feature to automatically bypass the role and user redirection rules and redirect the user to the previous URL. New Single Sign On (SSO) functionality. This new enhancement allows for other portals within the DNN installation to be able to access the portal if the SSO feature is turned on and the user enters the login credentials correctly for the 'Master Portal'. Additionally there is an optional 'Reverse SSO' feature to automatically add the user to the master portal if they are signing into the portal and that user doesn't exist within the master portal. Questions? Review more details here. Now add 'Dynamic Role Group Rules' to redirect the user to different pages based on any particular role groups they are part of (previously only support roles and not role groups). Updated performance enhancements and changes to support 4.3.x, 4.4.x, 4.5.x plus versions of DotNetNuke. Add 'Dynamic Role Rules' to redirect the user to different pages on your site based on their roles in the portal. Setup default forwarding to default users to a particular page that’s not just the home page. Add notifications to the administrator if a particular user signs in. Add message notifications to users/roles, once they sign in the message can be displayed to the user/role. Several extended and optional features to enhance the overall portal login process. No changes to DNN Core, simply add module to a new page and change the login page under 'Site Settings', 'Login Page'.